New Zealand's Antarctic Heritage Trust has announced an exciting find: 22 never-before-seen cellulose nitrate negatives discovered inside Captain Robert Falcon Scott's last expedition base at Cape Evans on Ross Island in Antarctica. The negatives were recovered as part of the Ross Sea Heritage Restoration Project, which is conserving items from Captain Scott's hut. The photos are from Ernest Shackleton's 1914-1917 Ross Sea Party, which was stranded for some time on Ross Island after its expedition ship, SY Aurora was torn from its moorings. 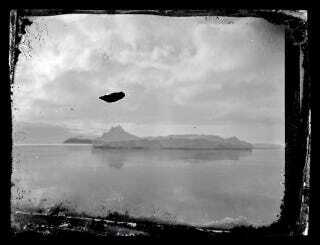 Up top is a photograph of Big Razorback Island, McMurdo Sound, believed to have been taken in January 1915 from the deck of the Aurora. Below is another photo taken from the deck of the Aurora looking South to Hut Point Peninsula, and a photo Alexander Stevens, Chief Scientist, on board the Aurora. You can see more of the recovered images at the Antarctic Heritage Trust.